Wisconsin style Slow Cooked Cider Brats with Apple Onion Relish is the real deal! Brush the bratwurst with olive oil and place on the grill. Gently poke the sausage in several places with the tip of a sharp knife to vent. Grill for about 10 minutes total time, turning the sausages to brown on all sides. Meanwhile pour the cider into a slow cooker and turn on low. Put the browned sausages into the slow cooker. Add the bay leaves and peppercorns. Cover and cook for 2 hours. At this point you can turn the slow cooker down to the warm setting to keep the brats ready and waiting for hours. To make the relish, toast the mustard seeds in a dry pan over medium heat until they start to pop. This will only take a few minutes. Remove from the heat and set aside. Peel and mince the onion. You should have about 1 cup. Add it to a small bowl and toss with 3 tablespoons of vinegar. Peel and mince the apple and add to the bowl, tossing well to coat all of the apple with the vinegar so it doesn't turn brown. Add the mustard seeds and toss. Add another bit of vinegar if needed to moisten the relish. Cover and refrigerate the relish until ready to eat. 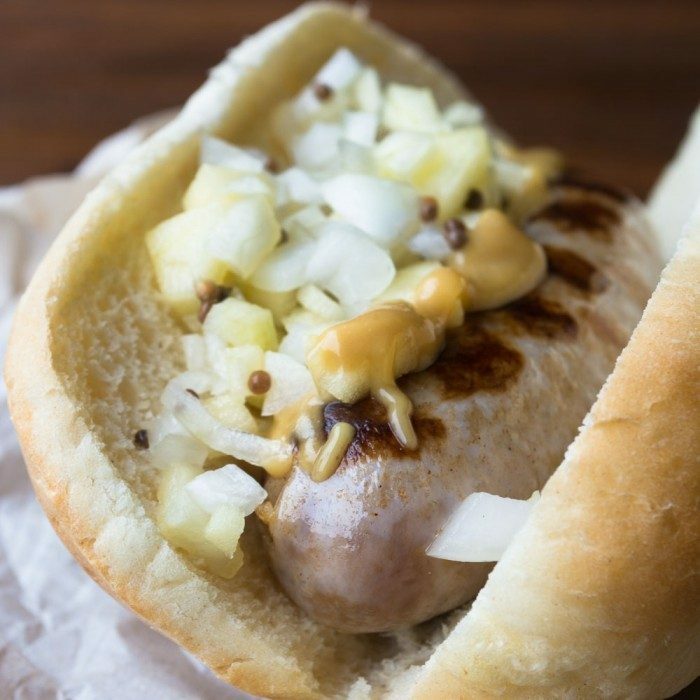 To serve, place a brat in a bun, slather with your favorite mustard, and load it up with the apple onion relish.